In case you hadn't noticed, a new "Ghostbusters" movies hit theaters yesterday, and early reviews and box office suggests that bustin' still makes some audiences feel good (though others opposed to the reboot think it's as bad as the coming of Gozer). 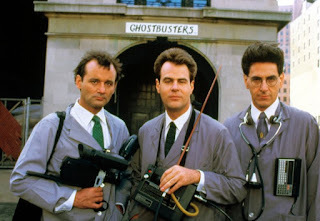 But love it or hate it, the new film is connected to the original in many regards, perhaps none more so than the involvement of Dan Aykroyd. Co-writer of the original movie, and executive producer (and vocal cheerleader) of the new film, Aykroyd even returns for a cameo. However, the erstwhile Ray Stantz enjoys a special connection to the spirit world. He was raised as a Spiritualist -- a belief system that communication between the living and dead is a positive thing -- and he also has an extensive interest in UFO activity. His father Peter, a renowned member within Spiritualism, wrote a book called "A History of Ghosts," for which Dan wrote the forward. And of course Dan Aykroyd's paranormal interest, and openness about them, extends to his Crystal Head Vodka -- a spirit of another sort that he says is made of pure Newfoundland deep aquifer vodka filtered through Herkimer Diamonds, or polished crystals that are supposed to emit positive energy. With the opening of the "Ghostbusters" reboot, I wanted to revisit a conversation I had with Aykroyd some time back about the popularity of reality-TV ghosthunting shows -- which receives a little mocking in the new movie -- and how it was impacted by his 1984 film. Even though he said there’s a big difference between mediums, channeling and other Spiritualist beliefs he holds and “ghost hunting,” Aykroyd thinks the overall effect of such shows is positive. “I think it’s great that people are employed. It’s giving work to people, it’s enlightening the public and it’s opening the subject up to discussion and debate.” He also added there is a parallel between the current paranormal trend in the mainstream and how Spiritualism was especially en vogue in the late-19th and early-20th centuries. A few years back, in 2010, things got pretty meta and mashed-up between real life ghost hunters and Aykroyd when the alter ego of the fictional Dr. Raymond Stantz joined his Spiritualist father on Larry King Live alongside busters Jason Hawes and Grant Wilson of "Ghost Hunters," and medium Chip Coffey. Reflecting on that, Aykroyd said he sees a similarity between the gadgets, the special vehicles and the team dynamics of the reality-TV ghost shows and his own "Ghostbusters" characters. “No doubt they’re inspired by us; I think so.” But as far as his own foray into the reality-TV ghost genre, Aykroyd will confine his work to fantasy, so there will be no guest spots on the shows. Instead, you'll have to show up to the new "Ghostbusters" movie to see Aykroyd discussing strange happenings in the neighborhood.